This week Will looks back and marvels at the The Crucible. A curious thing happens when you see a new production of a show you once worked on. An uncanny fusing of auditory time travel and welcome familiarity stacks upon the material. 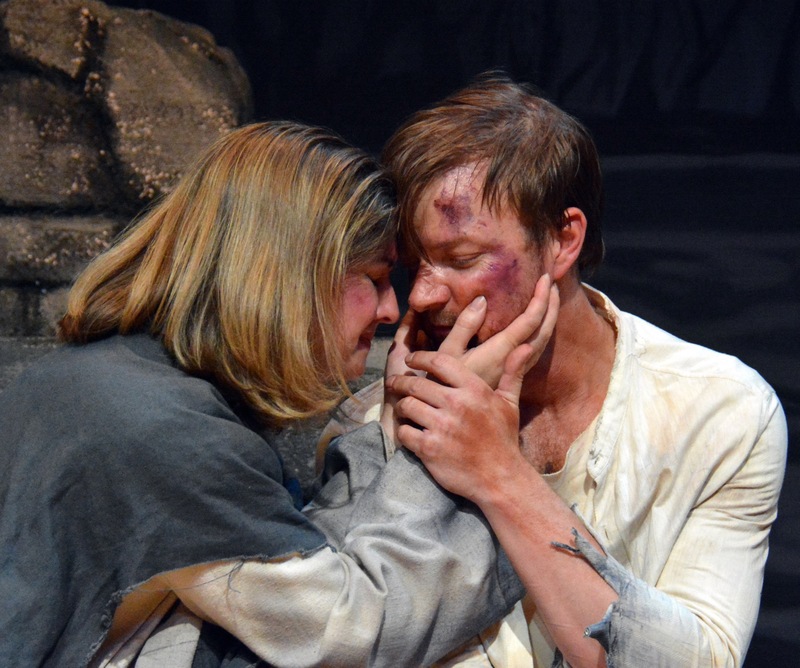 In the most recent case, I took in The Custom Made Theatre’s production of The Crucible directed by Stuart Bousel. This Arthur Miller masterpiece happens to be the first play in which I had the pleasure to act. I played the small part of Frances Nurse. I had 18 lines. I know because I counted them. Boy, was I proud of those 18 lines. I was also proud to have found a home amongst the odd, hodge-podge, theatre kids in my high school. Anyone within the theatre community can tell you their origin play and when they felt the bite of the theatre bug. What is nice, all these years later, is when I see a production that reminds me what good theatre feels like and possibly why I got into this creative madhouse in the first place. The San Francisco theatre scene is very proud of it’s new works. More new plays are premiered here than anywhere else in the country, or so I’ve heard. So why do The Crucible? Why now? We have a 1996 film version with Daniel Day-Lewis and Joan Allen. It’s hard to get better leads than those two. Often when discussing film and theatre, I can favor the best of the film offerings when placed against the average production here in the bay area. That may be an unfair fight, but we all have our biases. But this case is different. Why do The Crucible? Why now? Well, it’s never a bad time to put up a great play with outstanding actors and a clear vision of direction. More directly, there is a potency built within this play that unfolds more powerfully when performed in a close space. The 3/4 thrust staging of this current production refuses to allow the audience an emotional escape. We are locked in the closed courtrooms and cloying country houses as the world falls around these characters. In the best theatrical experiences, you, as an onlooking audience member, become a part of something. You are not separate. You are more than a mere watcher. You are entwined. Your experience wraps in the actions of the actors on stage and the fellow audience around. All become one, living the drama before us. The cast is large and I’ll admit, in the past, I might have thought it possibly too large for the performance space. But this is not the case. Due to the precise direction, I never felt that the cast was overwhelming the space or the audience. It just fits. In the film, the realism afforded in the setting also allows the dark clothes and the dark hair and the plentiful drab town-people to blend together. It’s easy to mix up one Goody from another Goody or one old grey haired judge from another grey haired judge. There are many admirable things about Nicholas Hytner’s film but the realistic breadth of the town may be a detriment that distracts from the emotional core of the story. The play does not suffer from this problem. One would think that the long scenes written into the structure of the play could create a pacing issue. With a less apt cast this might be true but the play clips by with speed and intensity. Film, in general, has the ability the solve pacing issues through editing tools or the ability to cut to new locations and new scenes without pause. However, this trick also can carry along an audience whether they are invested or not. 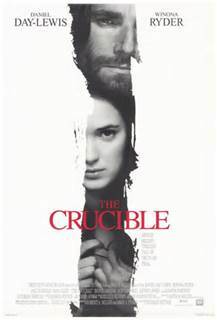 In this case, The Crucible film races over increased stakes and plot developments as Abigail cries witch, more towns folk are hanged and our dear Goody Proctor is accused. The way Arthur Miller writes the lengthy scenes of his play, the revelations have time to breathe and then impact the audience fully. The film covers all the same notes yet undercuts the emotional impact with truncated script choices. Arthur Miller, who wrote both the original and the adapted 1996 screenplay, would probably dislike my saying so of his screenplay. But the play simply works in a way the film does not. The film gives a fuller sense of the rampant chaos when Salem is turning with the witching upheaval yet it is from a more distant point of view. When John Proctor gets the news of towns disruptions from Mary Warren, it’s more personal news. As if a friend is dolling out town gossip to the audience personally. We overhear this news as if it were local gossip. The intimate space rounds out much atmospheric emotion. The production aspects that excel throughout are the costumes, acting and sound design. While the film matches the quality acting and costumes, the sound doesn’t achieve the disconcerting heights of the production’s original music and sound design by Liz Ryder. The soundscape is both haunting and moving. It folds the audience in the maddening world of Miller’s Salem, echoing the longing desire and futile separation inherent in every character. The silver screen can offer a personal journey that rings a unique bell in our being. I love the art of film and will always return there. But there is something individual about those journeys. Less communal. It’s personal. Great theatre is both personal and communal. Instead of “I see”, it’s “we experience”. We must not underestimate the power of sitting in a small space together screaming at witchcraft birds and the tragedy of prideful poppet pins. This production is a reminder of that power. The Crucible runs the next few weeks at Custom Made Theatre Co. You can get more info and tickets at http://www.custommade.org. Yamada, Jay. Proctor’s Final Embrace. 2014. Photograph. Www.custommade.org, San Francisco. Web. 27 May 2014.